@Upper Thomson | Get Your Grub On! Yesterday was Labor Day and I was still apathetic from the cycling in the morning. There was obviously a little to little oxygen in my brains and a little too much around my belly as I was absolutely starving but couldn’t make up my mind on what to eat. Thankfully my mate called and took this difficult decision off my hands by asking if I wanted to join him and his friend for some burgers at ‘Fat Boy’s’. Pants on, spinning the Bajaj and there I was. They were a bit in a hurry so I ordered a ‘Make-My-Own-Burger‘ on the fly. I went for a beef patty with jalapenos, monterey jack cheese all topped with a fried egg and smoked chipotle sauce. The burger was super juicy also because it was pretty raw but as I didn’t indicate my preference when ordering I had to blame it on myself. The patty was slightly under seasoned and really really soft but tasted super fresh and surprisingly light. The monterey jack tasted awesome and I had to pad myself on the shoulder for that extra thirty cents I had invested in this. I hardly tasted the egg but the spiciness of the jalapenos together with the smokey heat of the chipotle sure made up for it. I really liked it for it’s taste but found bun and especially the patty way too soft for a burger and as it was medium-very-rare it had nearly the consistency of beef tartar. Thankfully it was good quality meat so it still came out pretty tasty. If now only the bun had held up all the way til the end. 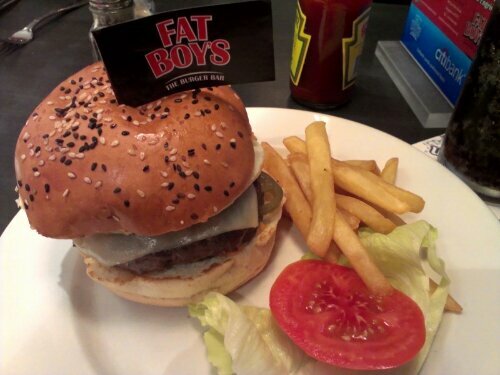 ‘Fat Boy’s’ is a nice open front joint with friendly people working there that serve up fresh and tasty food. On top I found out that they also have Nutella on burgers which proofed a brilliant choice last time at ‘De Burg’s‘ so I might just come back here to try their twist on it.